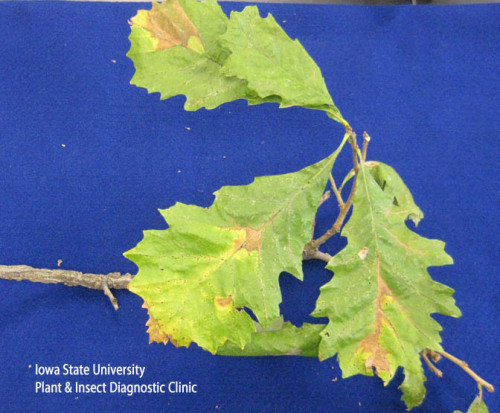 We are starting to get a lot of bur oak samples for bur oak blight testing and most of them are positive. This is a good time to identify BOB trees, especially if you are considering fungicide treatments next year. Ideal samples to test for BOB should include small branches (1/2-1 inch diameter) with symptomatic leaves still attached (see picture below). If you have any questions please contact us. Also, please see our online article on the Clinic webpage. Links to this article are strongly encouraged, and this article may be republished without further permission if published as written and if credit is given to the author, Horticulture and Home Pest News, and Iowa State University Extension and Outreach. If this article is to be used in any other manner, permission from the author is required. This article was originally published on August 29, 2012. The information contained within may not be the most current and accurate depending on when it is accessed.